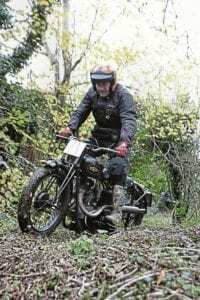 A new trials series has been announced for 2019, based around four long-established classic events, with the prime objective being to raise interest in the classic trials scene in the Midlands and south of England. With the four rounds being the Cotswold Cup in Stroud on March 24, The Sam Cooper Union Jack trial in Stratford-on-Avon in May, the Greensmith in Shropshire in October, and the Guy Fawkes trial, back in Stroud in November (final dates to be confirmed), there is actually scope in the calendar to add a fifth round. The trials will cover seven classes on two different routes – easy and hard – covering rigids, pre-unit, unit, two stroke and twinshock, and sidecars being optional and up to the organising club. or ‘trail’, if they so wish. Any clubs interested in running a fifth round can contact the organiser, Tim Fairbrother, on 01562 754827, bearing in mind that he hopes to run on a regional basis in 2019 and then progress to a British Championship in 2020!